5/3 Cup of Coffee: Pawtucket was lifted by contributions from two members of the 2013 World Champion Boston squad. Portland, Salem and Greenville all had a relatively meager offensive output in their respective losses. Riding the strength of Brandon Workman's arm and Daniel Nava's bat, Pawtucket easily defeated the Indianapolis Indians (PIT), 6-1. Workman hurled 5 2/3 innings, allowing one run on four hits and three walks, striking out eight. Rich Hill, Alex Wilson, and Tommy Layne combined to toss 3 1/3 scoreless innings of relief, with Wilson picking up the win. The PawSox were the first to get on the board, scoring on a Garin Cecchini RBI double in the second. The Indians tied the game 1-1 in the top of the third, and the game would remain that way until the bottom of the eighth. Pawtucket would score five times in the eighth, on a Ryan Roberts RBI single and a Nava grand slam. Nava has performed well since joining the PawSox, hitting .333/.414/.625 with two home runs and seven RBI in seven contests. Despite outhitting their opponent 8-7, Portland fell to the Binghamton Mets (NYM), 5-1. Mike Augliera fell to 2-2 on the season, tossing seven innings, allowing five runs (two earned) on six hits and three walks, punching out three. The Sea Dogs lone run of the contest came in the first, as Travis Shaw laced an RBI double. Shaw paced the Portland offense, going 2 for 3 with two doubles and an RBI. The Sea Dogs were just 3 for 12 with runners in scoring position and committed two costly errors, leading to three unearned runs. Mookie Betts went 0 for 4, but took a walk to keep his consecutive games reaching base streak alive at 53. Betts streak extends to 58 consecutive games when counting last year's playoff contests. The Lynchburg Hillcats (ATL) jumped all over Red Sox pitching as they brushed aside Salem, 7-2. William Cuevas fell to 1-4 as he allowed four runs on seven hits in four innings. Austin Maddox relieved Cuevas and allowed three runs on three hits in 1 2/3 innings of relief. Kyle Martin pitched well in his 2 1/3 innings out of the bullpen, allowing just a hit and a walk. Salem took an early 1-0 lead on Mario Martinez's RBI double in the second. Trailing 7-1 in the eighth, the Red Sox pushed across their second run of the game on a Reed Gragnani RBI ground out. Gragnani led the Salem offense, going 2 for 3 with an RBI and a run scored. The 23-year-old second baseman has been impressive so far in 2014, hitting .391/.463/.522 with six extra-base hits and 19 RBI. Greenville could not overcome an early 4-0 hole as they were stung by the Augusta GreenJackets (SF), 4-1. Ty Buttrey had a harsh welcome in his Greenville debut, allowing four runs (three earned) on three hits and a walk in just 2/3 innings pitched. Buttrey was victimized by a fielding error by Wendell Rijo and did strike out the only two batters he retired. The Drive scored their only run of the contest in the fourth on a Jordan Weems RBI double. Jordan Aro and Taylor Grover pitched well in relief, combining to toss 7 1/3 innings of scoreless relief, allowing just two hits while punching out eight. 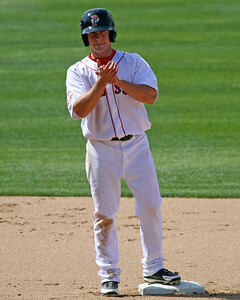 Player of the Day: Daniel Nava, who hit a key grand slam in Pawtucket's 6-1 victory over Indianapolis. Nava has hit well since being sent to Pawtucket, collecting eight hits in 24 at-bats, including two home runs and seven RBI. The 31-year-old outfielder figures to see a return to Boston with continued strong performance. Photo Credit: Daniel Nava by Kelly O'Connor.